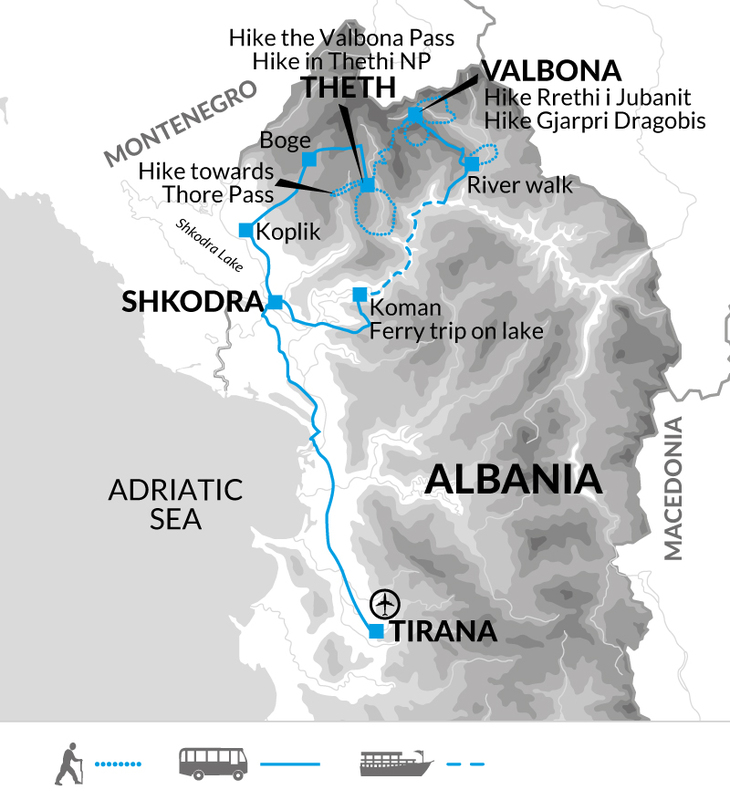 Explore the beauty of northern Albania, trekking in the little visited Albanian Alps, through the spectacular scenic Valbona and Theth national parks. Encounter a traditional way of life in remote villages, learning about the country's folklore. Join trip at Tirana airport and transfer by bus to Shkodra for your first nights' stay. Known as the 'Capital of North Albania', Shkodra is one of the oldest cities of the country. Founded in the 4th century B.C. the city is rich in cultural heritage and boasts a large number of artists, musicians, poets and writers. Time permitting we will vist the imposing Rozafa Castle that rises up on a rocky hill to the west of the city's entrance and, after dinner, take a walk around the city's pedestrian area, 'pjaca', with low elegant buildings from the Venetian period. This morning we drive from Shkodra to the docks at Lake Koman, before boarding our ferry. Described in the Bradt guides as 'one of the great boat trips of the world' our two hour journey takes us on glassy blue waters through twists and turns of narrow waterways beneath stunning mountain peaks. A truly beautiful introduction to the amazing scenery that Northern Albania has to offer. Once at the other side we drive to Valbona and dive into an alpine landscape, stopping on route for a beautiful riverside walk that will stretch out our legs and prepare us for the weeks' walking ahead. Today's six kilometre walk is expected to take around three hours with 220 metres of ascent and descent. A short drive after breakfast brings us to the beginning of our trail near to Drogobia village. We start a moderate climb, crossing meadows and patches of beechwood, climbing higher until we reach the elevated pastures known as 'Gjarpri I Dragobis' - the Drogobia Snake. It is the perfect spot to have a picnic lunch under the shade of a couple of isolated trees and to taste dairy products from the local shepherds that graze their herds here throughout the summer. We will loop the pastures, enjoying the spectacular views of the Dragobia Gorge on the opposite side of the valley, sided by numerous peaks, before descending to the bottom of the valley and taking a short drive back to our hotel in Valbona. Today's 11 kilometre walk is expected to take around five hours with 720 metres of ascent and descent. Today we will walk straight from our hotel to the mountain slopes in front of us tha create the massif of Paplluga. The trail winds through woods of beech and fir, crossing occasionally an old road used during the regime years for timber, until we reach the plateau known as 'Rrethi i Jubanit' and continue towards a panoramic spot where we'll have a picnic lunch. In front of us tower the magnificent vertical peaks of Grykat e Hapta, that create an impressive ampitheatre of limestone stretching till the end of the valley in the south west, where the Valbona Pass awaits for us to cross it in the coming day. After lunch we will continue to stay high on the plateau before starting the descent in the east facing slopes of 'Rrethri' to reach the hamlet of Kukaj where we will taste a cup of herbal mountain tea on the terrace of a local family's home. Refreshed, we will then descend to the bottom of the valley under the soft late afternoon light. Today's seven kilometre walk is expected to take around five hours with 460 metres of ascent and 520 metres of descent. A morning transfer will bring us from the hotel to the top of the valley in Rrogam where the road ends. Here our luggage is loaded onto horses and we start walking uphill to reach the Valbona Springs via a steep and winding forest trail. Later the walk continues into wide alpine pastures with large glacier erratic rocks, scattered here and there. The path then continues to steepen into a narrow trail that leads to the Valbona Pass. On clear days the views from this location at the heart of the Accursed Massif are truly breath taking. From here we follow a trail that winds through fir and beech forest and descends into the Thethi valley, also surrounded by a number of 2500m high sheer rocky domes, such as the Radohima and the Harapit. Today's nine kilometre walk is expected to take around seven hours with 1,050 metres of ascent and 1,300 metres of descent. Thethi is an iconic Northern Albanian 'malesore' (highlands) village. Enclosed in the full remoteness of the Accursed Mountains it stayed protected from the multiple invasions that afflicted the more accessible parts of the Alps and life was organised following the detailed rules of the 'Kanun' - the Unwritten Code of the Mountains. These aspects were well pictured by the Victorian traveller Ms Edith Durham in the book, High Albania, written on her journey into the area at the beginning of the 20th Century. We will spend the day discovering the village on foot in a succession of attractions such as the stone built catholic church, Kulla e Ngujimit - the blood feud lock in tower, the waterfall and then along the Grunas Canyon's ancient terraces towards the hamlet of Nderlysa; here we will have a tasty lunch prepared by one of the local families. In the afternoon, after some free time to relax by the natural pools of Nderlysa - created by the clear and icy water of the Kaprea Creek - a short transfer of around 20 minutes will bring us back to Thethi for dinner and overnight. Today's seven kilometre walk is expected to take around four hours with 420 metres of ascent and 660 metres of descent. This morning we leave our hotel on foot, passing through the village and crossing meadows and woods in a gradual climb in the direction of Thore Pass. Walking on the unsealed village road we will reach the memorial of Edith Durham, known by the highlanders as 'Krajilica e Malsis' - the Queen of the HIghlands - in respect of her support of the Albanian cause after World War One. This spot offers fantastic views on the Thethi Valley with the imposing big wall of Mt Harapit in full sight. From here we start driving into the scenic valley of Boga, slowly leaving behind the silhouette of the Albanian Alps and heading towards the Shkodra plain. In the afternoon our drive ends in the colourful Albanian capital of Tirana, where we stay in a hotel near the city centre. A city walk gives us the opportunity to learn more about the developments of Tirana throughout the various periods of influence, and have a taste of its cosmopolitan atmosphere. Today's six kilometre walk is expected to take around three hours with 950 metres of ascent and 170 metres of descent. Remember you are expected to carry your own luggage so don't overload yourself. Please bear in mind there are lots of stairs in Albania and no porterage in the hotels. Although entirely voluntary, tipping is a recognised part of life in this region of the world. Some local staff will look to members of the group for personal recognition of particular services provided. Accordingly, you should allow approx. €20 for tipping. Due to the size of the accommodation in the National Park areas a single room is only available on certain nights on this trip. On days five and six we stay at Pisha Villa in Thethi, this is a traditional Albanian family house and the rooms are simple but comfortable. There are modern bathroom facilities with showers, but not en-suite, towels will be provided. The number of rooms are limited and they accommodate two to four people in each so you may be sharing with other members of the group for these two nights. A private room at the Pisha Villa is available on request only, costing £80 please discuss with the sales team. 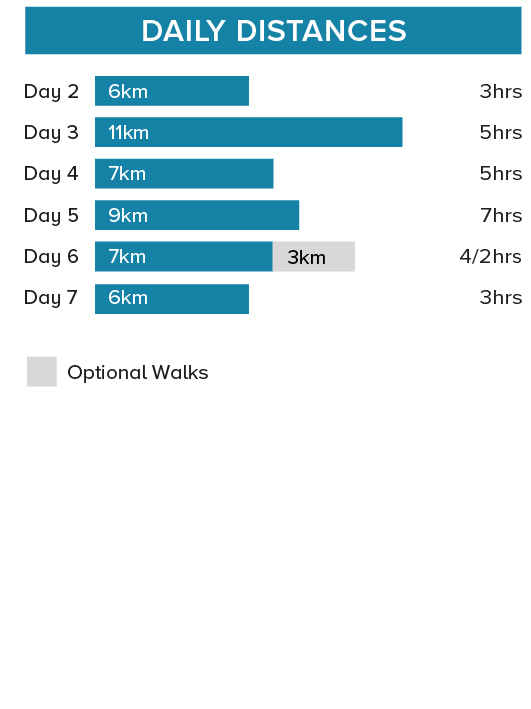 Walks on 6 days for between 3 to 7 hours. Most walks are on well-defined footpaths, mountain trails and some dirt tracks.